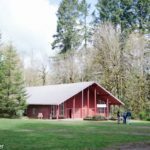 Our facility is located in a beautiful area between the Columbia River Gorge and the Sandy River, just 28 miles east of Portland. 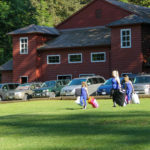 We are situated on 263 acres of beautiful wooded land. Our dining facility is capable of feeding approximately 300 people in one sitting. 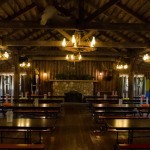 Walking in, you will find a roomy building adorned with western ambiance, including wagon wheel lights above, a large stone fireplace, and animal heads mounted on the walls. With a capacity to seat 400, the chapel is a great meeting place for your indoor activities. 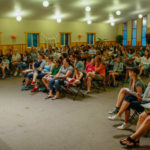 The chapel is equipped with a large, raised stage which is perfect for skits, a speaker or a worship band. We also provide a sound system and video projection for your use. If you are looking for a cozy atmosphere, there are four meeting rooms behind the main chapel that are perfect for small group gatherings. There is a fireplace in each of these rooms. 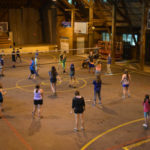 The gym is a huge recreation facility that is home to our rock climbing walls, carpet ball tables, volleyball and full size basketball court, as well as a game room upstairs. With a versatile asphalt surface, the gym is capable of accommodating many different games and activities. 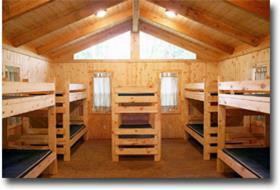 These beautiful cabins are the mainstay for retreat housing. 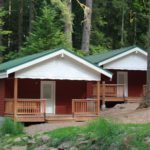 The cabins are conveniently arranged in two circles on separate side of the camp, one with 13 cabins each having a capacity of 15 people, the other with 12 cabins each having a capacity of 14 people. 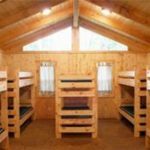 These cabins feature open beam construction, gable windows, gas heat, comfy bunks, and covered porch. 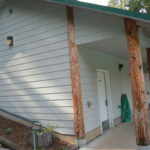 This cabins is great for special guests and speakers. This cabin comes with a small living room, a bathroom, and a bedroom with a king bed. It is carpeted and has a homey feel to it. 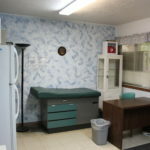 With its own bathroom, the nurses cabin is a great spot for speakers or leaders. The nurses cabin comes with a bedroom which has a queen bed, a bathroom, and a front room that has a futon bunk. This cabin also has a fridge and microwave. 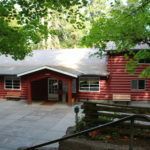 Above the lodge, there are six rooms and a central bathroom to accommodate guests. 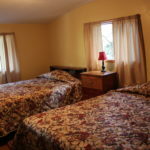 Four of the rooms have two queen-sized beds, the other rooms have one queen sized bed each. This is a great place for staff, or adults who prefer a little more privacy. Located in strategic areas throughout the camp, the separate bathroom facilities include showers and dressing areas. 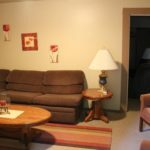 The bathrooms are clean, heated and have tile floors for comfortable use. Above the gym lobby, the game room provides a great place to hang out and play games. 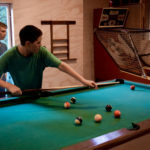 With foosball, air hockey, billiards and ping pong, you will be sure to find a game to enjoy. The playing field is a wide-open space with a wealth of hearty turf, located in between the gym and chapel. 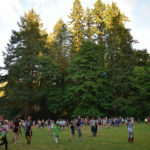 With plenty of room to run, the field is ideal for outdoor activities and group games. The Raz is a great place to hang out and watch the creek as the water drifts by. 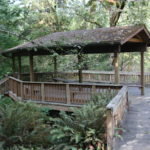 It is a great place for Bible Study, small group meetings, fellow shipping, and just hanging out in the out of doors. The pool patio is a great place to be on warm spring and fall days. The patio has round tables that are ideal for playing games, talking with friends, or just sitting and enjoying the day. 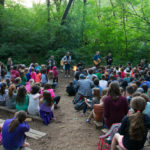 As the day turns to dusk and the sun begins to set, fireside is a great place to end the day with skits, songs, and a time of fun and reflection. This outdoor area has bench seating for up to 300 in an amphitheater style facing the fire pit. This is a great way to spend quality time together as a group. The Tree House is a great look out spot for a bird’s eye view over camp. 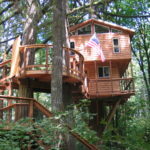 During the summer, campers can enjoy an overnight adventure in the two-story Tree House, which sleeps up to 14 people. 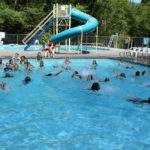 We offer two pools, available from Memorial Day to Labor Day. The game pool is shallower pool, ranging , from 3′ to 5′ and is great for splashing around. The deeper dive pool includes a 46 ft. water slide, diving board, and a basketball hoop.